Jockey Ben Melham has moved a step closer to playing his role as the spoiler in what is viewed as "The Black Caviar Handicap" at Flemington on Saturday. The Racing Appeals and Disciplinary Board shaved two days off Melham's careless riding suspension incurred at Flemington last Saturday, paving the way for him to partner Star Witness against the world's best sprinter in the 1200m Group 1 Newmarket Handicap. Star Witness is considered one of the few, if not the only, horse capable of upsetting Black Caviar. Melham rode black Caviar to win the Group 1 Patinack Farm Classic (1200m) at Flemington last spring. "How do I beat her? I'm still working on it," Melham said. "She is a true superstar, a real champion. Everything she does, she does so effortlessly. Where she has an edge is that everything spends all their fuel trying to get close to her and then she lets go and breaks their heart. "If there is a horse capable of beating her, it's Star Witness. He's an out-and-out sprinter, he races well down the straight and his work has been very good." What's given Melham and trainer Danny O'Brien a glimmer of hope is that Star Witness meets Black Caviar 5kg better at the weights and has a 2kg turnaround from the Patinack Farm Classic, when the unbeaten mare beat him home by four lengths. Star Witness's brilliant gallop yesterday gave trainer Danny O'Brien and Melham further cause for optimism. Star Witness thrashed stablemate Keano by five lengths in a gallop down the Flemington straight, running the last 400m in 21.71sec. "He stretched out beautifully. He's as well as can be and he's a very good colt, especially down the straight. I won't have any excuses on Saturday," O'Brien said. "I would back him to have won any of the past 10 Newmarkets, but the problem is he's taking on a freak. 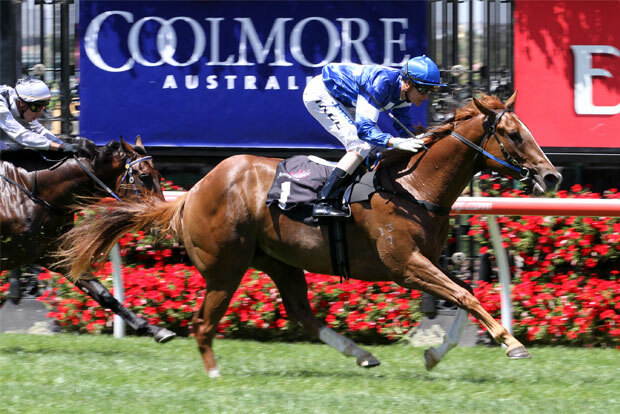 The handicapper has been very fair and given us a chance with 5kg on Black Caviar, but she is as good a mare as I've ever seen at the sprint trip."